He comes to Seattle for a few weeks just to write poems. He takes time off from a teaching job in Austin, Texas to fly up to the Emerald city, stay with friends to type up poems about West Seattle. What's in it for him? Nothing but joy, it appears. 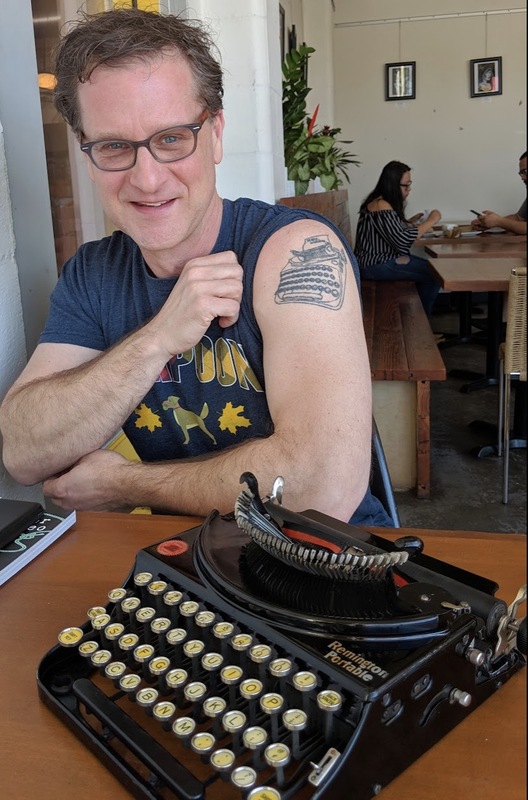 His name is Sean Petrie, 48, a law professor with a deep love of poetry and a yen to write poems in a soon to be published book about West Seattle called LISTEN TO THE TREES. The poems are from local residents' ideas. Sean asks “What do you love about West Seattle?” They tell him about an event, a place, a time or personal experience from living on the "Duwamish Peninsula". LISTEN TO THE TREES collects those poems, along with beautiful now-and-then photos of the poem topics, into a snapshot memoir reflecting the cares and concerns of the city’s residents amid the sheer, bustling energy of a street fair. Photos from WESTSIDE STORY, a 1987 coffee table book by Clay Eals and The West Seattle Herald will also be featured inside. Many poems delve into West Seattle’s past — odes to cherished places long-gone, ancient advice from its native Duwamish inhabitants, and what it was like growing up in a city so steeped in history. LISTEN TO THE TREES is a tribute to the history, diversity, and rich beauty of the Duwamish peninsula. In short, it is a love letter to the area, in book form. Poem titles might be "Walking West Seattle" for Anna or "Husky Deli" for Emma. They always include the name of the person requesting the poem.There are no specific rules except the poems are limited to about what can fit on a 1/2 page vertical letter sized page. Sean calls it on-the-spot poetry and it only takes minutes. Sean was here last summer for the annual street fair on California Avenue, sharing a booth with the Southwest Seattle Historical Society. The historical society hired Sean to write these poems and is fully behind Sean's efforts to get the book of poems published through Documentary Media. The poems are double-spaced, half a letter sized page and all done on a 1928 Remington manual/portable typewriter Sean bought on eBay and confesses, "yes, it is hard to type on" and that it requires a lot more finger pressure to actuate the key strokes. This also adds to mistakes in typing you may have learned in typing class many years ago. "You're going to make mistakes," Sean explains but mistakes are part of the process. They are not corrected. Sean considers them part of the charm of the poems on the pages. "Typewriters were built to last, and built to be USED," Sean said. "There is nothing more satisfying to me than the “clack” of each letter being imprinted on paper," Sean beamed. "Of seeing each letter permanently stamped as you type it. With a typewriter, there’s no “delete” key, no eraser. You make a mistake, you can’t take it back – just like life, which I find wonderfully freeing; because I KNOW I’m going to mess up with a typewriter lots of times!, I don’t worry about it. I just type and let the words flow out," Sean added. The idea sprung from a quartet of poetic friends in Texas who create spontaneous poems for people at street fairs, farmers' markets or any convenient place people gather and have time. They'll write about anything, taking only moments to complete a poem followed by hugs and high five celebrations. It's personal, it's fun and it's free. The four poets call the group the TYPEWRITER RODEO, from a book of the same name published last year by Andrews McMeel of Kansas City, Missouri.